Psalm 130:5 I wait for the Lord, my soul waits, and in his word I put my hope. How many of you have seen the movie, Charlie and the Chocolate Factory? There is a girl named Veruca Salt who is a demanding character that wants whatever she wants...NOW! If you recall, she even sings it in a song. If I was honest with myself, I would realize that much of the time, I want things to happen now, just like the spoiled girl from the movie. As someone who has moved 13 times in 11 years of marriage, I want to be settled in a home soon. We are currently looking into a home we love and would like to be in that home rather quickly. There are lots of details to work out which is making the decision a pending one. So we are praying about it and hoping it all works out as this would be the home we settle in for awhile. A lot of me wants all the details worked out so we could move into the house. (Voice in head says, "I want it now!") I don't want to take the slow process of trying to get our other home sold in order to be in this home. I don't want to wait many months or have to think about getting things packed up to get to another home. I want to be settled and I want to be in the new home. But God is working on my patience as He teaches me to wait. I wait for our home in CA to sell. I wait for the finances of it all to get figured out. I wait on God to see if this is truly something He really wants us to do. If it is, He will pave the path for us. He never promises it to be an easy path. But He does promise to always be there for us along the way. Another song comes to mind as I think about waiting. Lincoln Brewster sings a song that says, "Strength will rise as we wait upon the Lord." It's the reminder that we need in knowing that God's timing over our timing is what we need to seek. So as we go on with our life, waiting upon the Lord, just know that His ways are good. Sometimes we wait because it's not the right direction for us and God has other plans. Sometimes we wait because it's not the right time. Sometimes we wait so that we can grow closer to Him through the process. I love a quote I read several months back that said, "Waiting time is never wasted time." This is something we need etched in the back of our minds as we wait for whatever we want to happen in our lives. Jot this quote down and carry it around with you. It's a great one to remember. Heavenly Father, I don't always like to wait. I want things right now. But Your ways are good. You know what is best for me and when I need things. You know what lies ahead. Just like the birds of the air, I do not need to worry about tomorrow. You've got this, Lord. My days have been numbered by You and You know what happens next. So I pray that I lean to you when times of waiting are hard. Help me to wait and not worry. I pray for strength in knowing that I can be patient. Thank you, Lord, for always taking care of me. Amen. How often do you open up and share with others the realness of your heart? How much do you really put yourself out there to share the real you? Instead of sharing the pieces of the good parts of what can be deemed wonderful in your life, how much do you share that you struggle with too? When I think of how our natural tendencies of this day is shared on social media with perfection, I feel we loose a sense of connecting in a way that shares the interpersonal side of things so much. We as humans long to see others in real-time dealing with real, everyday struggles. We want to know that the normal part of life is that we all have the good mixed in with the bad. We want to find others who we can expose the struggles with that we face each day. Even more, we want to feel like we aren't that strange. In a sense, when all we ever seem to see is everyone's best, it makes us feel inadequate. When other people appear to have it all together, it can make us feel crazy. Unfortunately, although we shouldn't compare, we find ourselves doing so when others only share the good parts. For a long time, I fell into a trap of putting my best out there for the world to see. I rarely opened up and I rarely wanted anyone to see the real me. As Christians, it's easy to fall into the trap of wanting to do things right, desiring to be labeled "good." However, that is works-based (Ephesians 2:8) and approval-seeking. That is not how Jesus see us. He sees the real us. I am a believer of Christ who lives in a fallen world. I am faced with everyday temptations and make mistakes often. Nonetheless, I would share my good side on social media portraying the things that deemed myself content while uploading pictures of all that I may have been "blessed" with by God. Then came a time of real hardship with a struggle of trying to breathe air. It was a time of truly feeling like I was soul searching and discovering many things along the way. Finally, I discovered the power of opening up and sharing the battles with others. It's a huge release when we can share the real us to the world. Folks, why do we worry about sharing the good, the bad, and the ugly? Why can we not only celebrate the great things in life but also pour out our hearts in a way that we can connect on a deeper level? Are we afraid that our problems will bring only annoyance or trouble to someone else? How about instead of seeing our concerns as torture for another person, we see it as a blessing for them to give wisdom? I don't know about you but there is a special something that happens when we uncover another person's reality. We can be humble about our experiences. We can use that knowledge to love one another and pray in those areas for one another. More than anything, we can be an encouragement to another by being real. *** Do you enjoy writing? Do you have a blog? Come join the party. Every Friday, you are given a word/topic to write about on your blog. 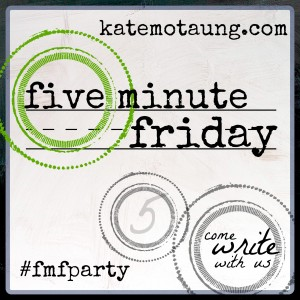 Spend five minutes (or in my case more), and link up your blog at www.katemotuang.com. When I was a little girl, I was pretty introverted and shy. I often blocked my feelings and emotions from other people. Instead, people would find me with a smile on my face despite what I actually felt on the inside. 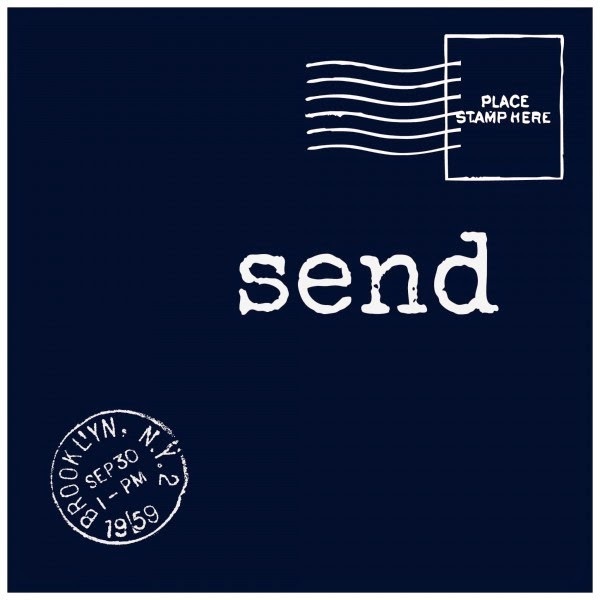 Contrarily, one of the ways that I would tell someone what was on my heart was when I would send them a letter. One example of this was when my younger brother and I would fight a lot. Like many siblings, he was one of my best friends but we would also spend a lot of time annoying each other. So when we were sent to our rooms because of fighting, we'd find ourselves moments later sending each other letters in our pretend mailbox in the hallway. Often, one of us would roll a ball to the other's door to notify them of a letter we snuck out to place in the cabinet drawers of the hallway. The other would sneak out to retrieve the letter and respond. Comically, the letters would be us talking out the issue and forgiving each other . As a teenager, when I went through a rebellious stage, I would only open up to my parents through writing them letters of how I was feeling. It was just my way of communicating. I don't like confrontations and being able to express myself through writing was the only way I felt it could be done. To this day, I will write letters. I love to not only send letters to work out a problem, but letters to encourage as well. To me, there is something about sending and receiving a handwritten letter. It's a tradition that is getting lost in this day of technology. I often think of the times in the Bible where Paul would write letters to the churches. They were not only letters of behavior but they were also letters of encouragement. He wrote with wisdom and he shared his own stumbling blocks as well. As believers, I think we could use written words to communicate in various ways as well. Often times, we all get busy and forget to communicate. I find my source of strength sometimes through writing, whether sending someone a letter or taking the time to journal. I am thankful for that gift that God has given me. I hope to use it to be a blessing to others and to mend relationships as well. Let me be an encouragement to you today to send someone a letter, whether you deliver in the mail or in person. Write your husband a letter and share with him how much you admire him. Write a parent and thank them for how they raised you. Write a friend and encourage them with something they are struggling with in their life. Write someone who is hurting you and try to make it right with them. Find some beautiful stationary or create your own. Find a quiet place and express yourself through your thoughts. May you find the joy and peace that you hope to gain from the letter that you send. Waking up to another gloomy day, I brew some coffee and pop into my mouth my daily dose of Vitamin D3. The twins belt out their Hungry Cry which sounds like two freight trains crossing paths on the imaginary railroads around me. They await for me to change them and give them cereal. My three year old is pounding the table screaming for breakfast with a weary look on her face. I am attempting to awake the other three to start their day but I am met with groans and sheets pulled over tired faces. I am feeling unwelcome. I let out a huge sigh and continue getting everyone ready for the day. We load up in the van and get ready to drive out to the store to get groceries for the new home. Upon making several false turns along the way, we finally make it. We enter the store and begin our shopping. As we pass by the strangers and unfamiliarity of this place, we are met with comments about the large size of our family, some with curiosity and some with scoff. We press on through the store and get back home. Then, I pause. My self-talk sinks in and I start thinking about the newness of this place: a new town, new neighbors, and new friends. The exciting reality of moving to a new place has worn off a bit and I start to feel a bit unsettled over the lack of welcome I feel in my new surroundings. My fears get the best of me as I realize I don't know anyone. Every bit of familiarity we had at our previous location is gone. I don't quite feel welcome yet. When we don't feel welcome in our current situation, whether it be at a family gathering, a new town, or a simple gathering, we need to remember we are not alone. We are NEVER alone. God is there to hear our every cry, our every concern, and our every fear. He will never leave us nor forsake us. We can hang on to that promise. Do you remember the story of Ruth from the Bible? Her husband dies as does her father-in-law. She could have said, "See ya!" and stayed in her hometown with her original family. But she doesn't. This woman decides that she would go brave and travel to her mother-in-law, Naomi's land. Naomi practically begged her to stay there and Ruth responds with one of my favorite words from the Bible. Ruth 1:16 But Ruth replied, "Don't urge me to leave you or to turn back from you, where you go I will go, and where you stay I will stay. Your people will be my people and your God my God." From there, we know that Ruth follows Naomi to Bethlehem and ends up meeting Boaz. Both she and Boaz end up marrying. He redeems Ruth from a life of poverty and being a widow. Even more, from that lineage comes Our Redeemer, Jesus Christ. Sometimes we will go through life and the people and places we are in will hurt us. We feel like the oddball at the annual Thanksgiving feast. We feel like we have nothing in common with the couples at our husband's work party. We feel completely lost in a new place. 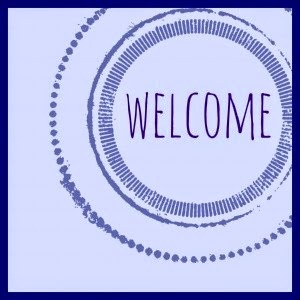 We will not always feel welcome. But we CAN be brave like Ruth in whatever place we are in. We have to just trust God with our surroundings and know that He will always welcome us into His arms. "Did you see that Ruth just going out to the field gleaning wheat like it was her own?" says Woman A. "Seriously! And then she was over there smiling and glancing at Boaz. She has hardly been a widow for that long. The nerve!!!" says Woman B. "If I were her, I would have stayed where she was at and lived with her family. What business does she really have here?" says Woman C. And on and on it goes. We've all felt it at one time or another. We've all wanted to be liked in our surroundings only to be met with the opposite. But not everyone gets the red carpet with flower petal treatment. Some people are going to find us strange. Some people won't see our personality as something great at all. Unfortunately, we will all have moments of being unwelcome. We may not feel welcome among our neighbors at times. We may not feel welcome among certain relatives. We may not feel welcome at a social event that we are attending. But what matters most is that we never need to worry about being welcomed by God. I thought it'd be fun to rewrite the lyrics and dedicate this version of the song to all my homeschooling mamas out there. I wish I had a computer with an editing program and a video recorder and I'd record the song. 'Bout that school, not public. 'Bout that school. not public. All the right people in all the right places. Yeah, my momma she told me don't worry about the stares. When the naysayers approach you, who gives a care.